Dame Zandra Rhodes presented “Party with Z” on Oct. 30 at the Westgate Hotel to a sold-out crowd. 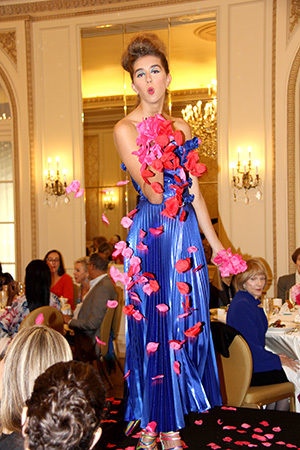 This luncheon fashion show is highly anticipated each year. The guests sat down to a menu prepared by executive chef Fabrice Hardel with themed names by Jeanne Jones. Rhodes presented The Party Collection to an eager audience and narrated each garment as they came down the runway. 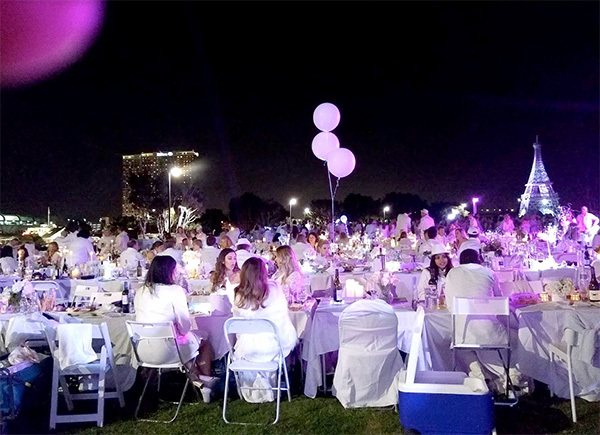 Guest models — along with San Diego influencers such as Sherry Ahern from The Connector, Tabitha Lipkin from Fox 5, and Cindy Matalucci from The Pulse SD — rocked the runway. Many designs were from the past with Zandra’s classic prints and some with her famed pleating. The new pieces showed off fan pleating in gold and silver lame. After the show, guests were able to come backstage, try on the garments and order one with a custom fit. Funds raised benefited the American Friends of the Zandra Rhodes Museum in London. The museum is currently showing “Cecil Beaton: Fashion, Film and Fantasy. ” For more information about Zandra, visit zandrarhodes.com. One of the things Zandra is remembered for is the cape Freddie Mercury wore on stage with the rock group Queen. With the recent release of the film “Bohemian Rhapsody” about the life of Freddie Mercury, I jumped at the chance to interview Rhodes about her experience with him. She said that he called her studio off Bond Street London in 1974 to see about coming over. Both Mercury and Brian May, the band’s guitarist, came in and she said to them, “Have a look.” They began to look through the rail of clothes in her little studio. Mercury picked the now infamous cape that was photographed by Mick Rock and is always shown when speaking about Mercury. The guitarist Brian May took three tops. The group invited Rhodes and a guest to one of Queen’s concerts in Earls Court Olympia. Rhodes said she went with Doggie Fields, the painter, and remembers that everyone in the audience was about 15 years younger than them. Since Mercury’s death, May, who also holds a Ph.D. in astrophysics, has been involved with AIDS charities. I asked Rhodes what was coming up in the future for her. She said that her new book, “Zandra Rhodes: 50 Years of Fabulous” is coming out at the beginning of September 2019. In conjunction with this, the Fashion and Textile Museum will have a 50-year retrospective in the museum at the end of September 2019. There will also be an exhibition starting June 2019 at John Wayne showing the costumes from the Opera’s “The Pearl Fishers” and “Aida.” In addition, Zandra will be a guest influencer at the Formex Museum in Stockholm, Sweden. A reproduction of Zandra’s flat in London will be shown there from Jan. 15-18, 2019. Sunday, Jan. 13, 2019: Winter Bridal Bazaar with fashion shows presented by Gretchen Productions at the San Diego Convention Center. Three shows presented throughout the day. For more info: 760-334-5500. —Diana Cavagnaro is an internationallyrenowned Couture Milliner based in the Historic Gaslamp Quarter. Learn moreabout our Hat Designer, Teacher & Blogger at DianaCavagnaro.com.